1) A "drunk driving" offense consists of driving under the obvious influence of alcohol and/or drugs clearly evident by physical attributes such as erratic driving, slurred speech, unsteady gait, and performance on a field sobriety test. This crime generally results from an officer's observations of a vehicle or the reports of other motorists. 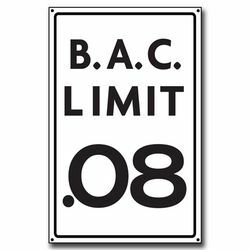 2) A "per se" offense relies heavily on the results of a blood alcohol concentration (BAC) test given at the time of the incident as evidence of the driver’s impairment and/or intoxication. An individual may be charged with both offenses if both offenses are present. Driving under the influence in Indiana often results in a Class A misdemeanor charge for the driver involved and is punishable by up to one year in prison and up to a $5,000 fine. However, the offense may be elevated to a felony if the incident involved a fatality, serious injury, or extensive property damage. (See more DUI law information here.) Accidents involving serious injuries often result in a felony DUI for the driver under the influence. Accidents involving fatalities result in the impaired driver receiving a much stronger sentence, such as vehicular manslaughter or vehicular homicide. Felony DUI charges, vehicular manslaughter, and vehicular homicide charges can all result in sentences that include up to 3, 8, or 20 years in an Indiana State prison. Keller & Keller has represented hundreds of people injured in alcohol-related crashes throughout Indiana wherein our client had no fault for the crash. The majority of these cases involved our client being struck by a drunk driver, or being in a car with a driver who was under the influence. No matter the circumstances, when you're injured by a drunk driver, we are often able to help you obtain a maximum recovery for your injuries and any lost wages you may have incurred. Every 33 minutes in the United States, someone dies as a result of an accident involving an intoxicated driver. Indiana's DUI statistics are equally frightening. Approximately 17-19% of Indiana's crashes involving fatalities are caused by an intoxicated driver. To further illustrate, in 2003, serious Indiana auto accidents killed 835 Hoosiers. Of the 835 killed that year, 144 Hoosiers died as a direct result of intoxicated driving. ​Approximately 3 of 10 Americans will be involved in an accident involving a drunk driver at some point in their lives, and according to one government study, over one third of all deaths of people age 15-20 are a result of driving while under the influence of drugs or alcohol. These statistics serve as clear evidence as to why drunk driving or driving under the influence is an epidemic affecting America's roadways. Keller & Keller also operates under a zero-tolerance policy when one of our clients has been injured by a drunk driver. We work especially hard to ensure the insurance company pays every dime to properly compensate you for any and all injuries and property damage caused by a drunk driver they insure. We take a large measure of pride in pursuing justice for someone who was injured by a drunk driver. On May 17, 2005, our client was a passenger in a vehicle driven by a friend headed northbound on a two-lane road. A drunk driver, southbound on the same road, crossed the center line and struck their vehicle head-on causing a devastating accident. Tragically, the driver of our client's vehicle died immediately at the scene. Our client was severely injured and was life-lined to the nearest hospital. At the hospital, X-rays were done and the diagnosis was severe. She had broken bones in her leg and foot and would require extensive surgery. She had broken multiple ribs and had sustained a pulmonary contusion. A large laceration on her head had required numerous staples and stitches to control the bleeding, but was stabilized at the hospital. Our client underwent two major surgeries to repair the damage to her leg and foot before beginning the 6 month process of physical therapy and outpatient visits to the doctor. During this time, our office aggressively worked to uncover the facts of the accident and to secure 100% liability. One factor that complicated this case was that the adverse driver was found guilty of driving under the influence and was sentenced to serve time in jail. Our attorneys worked with the authorities and the driver's insurance company for the chance to question the driver about what exactly happened on the night of the accident. Keller & Keller was able to settle our client's case for the maximum limits provided under the insurance policy. Our client, however, was still experiencing health complications as a result of the accident. Her doctors had advised our office that our client would not be able to work in the near future and would require in-home care. Our client was concerned about making ends meet and wondered where her income would come from if she couldn't work. Following the settlement, Keller & Keller referred her case to our Social Security Disability department where we managed her claim for disability benefits through Social Security. In the end, we left no resources uncovered and we pursued a settlement that held the drunk driver to maximum accountability. While every case will have unique facts, different timeline, and value, we can often determine whether or not we can help you after one phone call. If you've been injured by a drunk driver, call our offices immediately to schedule a free consultation.